It's a new beginning, a new endeavor. No matters how much ideas I have in my mind all the time, I usually do not put them into actions. That applies to a lot of aspects in my life. But I really can't help myself this time. I got to try out taking food pictures. Quickly I went to the "blackhole" where I store all my junks in the house and found some recycling gift wrap tissue paper, cardboard, unused placemats; pulled out some dinning ware that I don't use that often; found a spot in the house with a bit of natural light; and took a million of pictures of last night's leftover. Here are the two that do not show any obvious mistakes, except some dust on the placemats which I was too lazy to remove with photoshop. 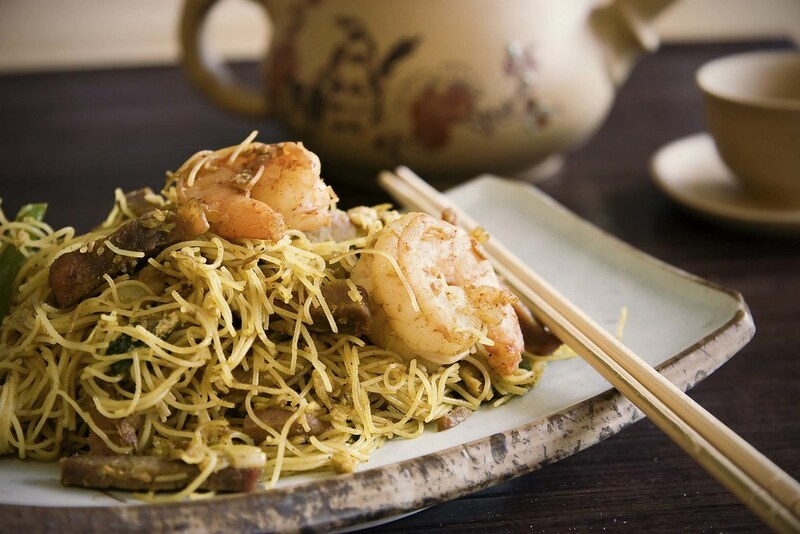 This recipe of Singapore Stir Fried Vermicelli is adapted from Fine Cooking Magazine and can also be found on Rasa Malaysia, one of my favorite Asian cooking blog. I had some failures cooking this dish before. It was either too soggy or the taste was not right. One of the key is the type of noodle used. It has to be made with rice and water only and it is the fine and round rice noodle, not the big flat ones. After some research, I also found out that some Chinese chefs put in a litter bit of ketchup to round out the flavor. The dish turned out to be great this time! Soak the noodle - Soak vermicelli in hot tap water for 8 to 10 minutes (or according to package instruction) until soften. Drain noodle and set aside. Make the sauce - Put 1 Tbsp oil in a small saucepan over medium heat. Add the curry powder, minced garlic and sauté for 20 sec.or until fragrant. Add the broth, soy sauce, sugar, sambal, and salt. Cover and cook for 3 minutes. Remove from the heat and set aside. Stir fry shrimp and bbq pork - Heat a large wok or saute pan over high heat, add 1 Tbsp oil. 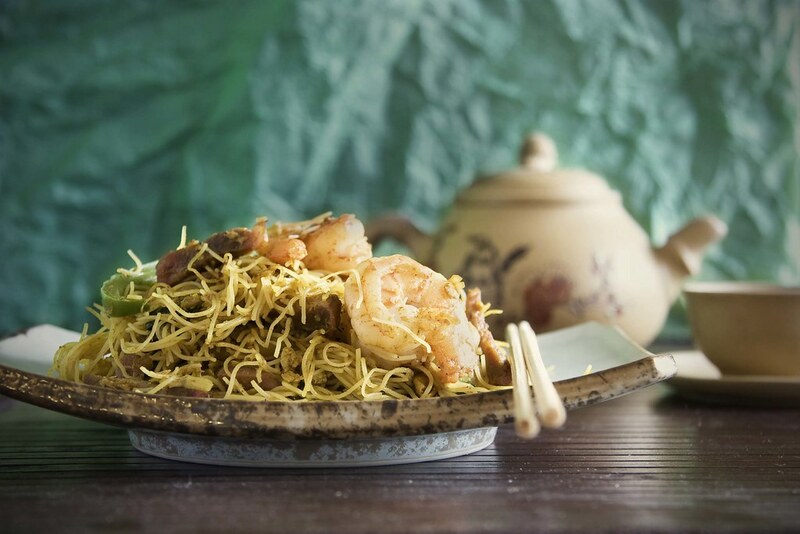 When the oil is hot, add the shrimp, sprinkle 1/2 tsp salt on the shrimp, and stir-fry until just cooked through, 1 to 2 minutes. Add the barbecued pork; toss well. Put the shrimp and bbq pork aside. Stir fry vegetable - Add the remaining Tbsp of the oil the the wok. When hot, add the garlic and the ginger. Stir-fry until the garlic is golden, 10 to 20 seconds. Add the onion, chili pepper, bean sprouts, scallions, and mushrooms. Stir-fry until crisp-tender, 2 to 3 minutes. I love making singapore noodles, but have never added tom ketchup. May try that next time. len - Thanks. Out of the junks, that's the only thing I could find to make my background at that time. I'm glad that you like it. Debs - I was suspicious at first too. But after I tried it, the ketchup seems to have add a little something to the dish. Let me know what you think after you try it. you are off to a beautifully delicious start!